Want to be notified of new releases in garethcull/forecastr? … the uploaded csv and determine if there are any null values within. If there is a null value, an error message shows up on Step 2, which tells the user that there may be an error with a particular row. A flask web app that leverages Facebook Prophet to provide people with the ability to build simple baseline forecasts from within a guided user interface. forecastr is an experimental flask app I created as a proof of concept to see what it would take to create a UI on top of Facebook Prophet. 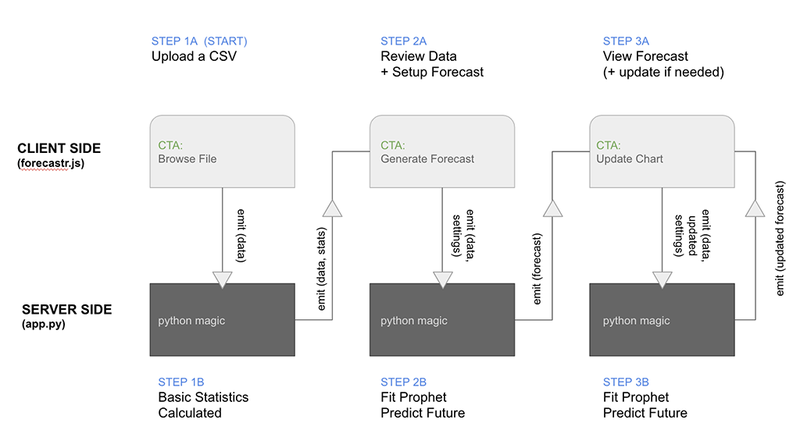 It provides the user with a 3 step interface that guides them towards building a baseline forecast with Facebook Prophet. This app doesn't store any data about the contents of the uploaded csv within a database. This is a session based product. Once the csv has been uploaded to the app, the data is then stored within temporary variables in the client and data is then sent back and forth between to client and server until the forecast is generated. As an example, Let’s say a user is at Step 1. They’ve decided to try the app and click on the CTA “Browse File” and choose a CSV to upload. The app then parses this data and sends it server side to a python script that calculates some basic statistics about the data before sending it back and then forward to visualize on the second tab (ie. Step 2: Review Data + Setup Model). Again, this app does not store any data about the contents of the uploaded csv. I also used the logging python library to suppress any logs echoed during transit between the client and the server. There is data collected on how people use the app. This data is collected using Google Analytics via a Google Tag Manager implementation. Whether a user has downloaded a sample csv. You can view the forecastr_v4.js and behavioural_analytics.js files to see what data is being passed to Google Analytics via the dataLayer.push(). I then use Google Tag Manager to create rules that listen for any ux events and then send that data to Google Analytics. How to run this locally. Clone this repo and make sure you install all of the above dependencies.